#TVisCOOL: Sometimes amazing things happen on the subway - Damiyr - sings Asaf Avidan! 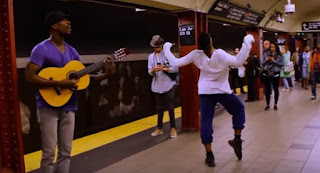 Sometimes amazing things happen on the subway - Damiyr - sings Asaf Avidan! Damiyr sings One Day/Reckoning Song by Asaf Avidan in the Subway and something AMAZING happens! The Dancer's name is Brandon Gray. He's incredible.